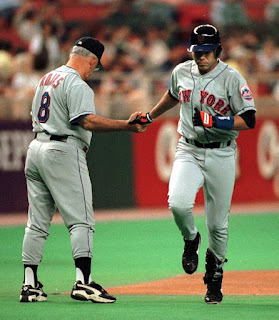 Tuesday June 15th 1999: Bobby Valentine's second place Mets (34-30) went to Cincinnati to face Jack McKeon's third place Reds (32-28) in front of 18,248 at Cinergy Field. Tonight the Reds sent Brett Tomko to face the Mets Rick Reed. The Mets would win nine out of the next ten games, giving them a stretch of 16-3 from June 6th to June 25th. They would win 97 games on the year, winning the NL wild card crown. Reed had a good night, allowing just two runs over eight innings of work. He struck out five walked two & scattered eight hits along the way, earning his fourth win of the year (4-3). But it was all about the Mets offense. 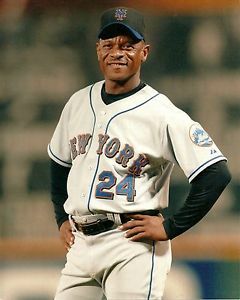 The Mets battered Tomko around in the first inning, as Rickey Henderson led off the game with a HR, his record 74th HR to lead off a game. Edgardo Alfonzo then walked. John Olerud & Mike Piazza followed with back to back HRs putting the Mets quickly ahead 4-0. For Olerud it was HR #11 & Piazza #13. In the 5th inning Alfonzo connected with his 9th HR of the year making it 5-1. In the 6th inning the Mets Matt Franco added another HR, the Mets fifth HR on the night making it 6-1. The Mets 7th inning was another biggie, Henderson hit his second HR of the night as he led off the inning with his fifth of the year. The HR tied a Mets record at the time, with six HRs on the night. 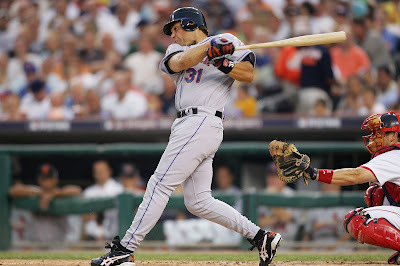 Trivia: On April 19th 2005 the Mets would hit seven HRs in a game as Jose Reyes & Carlos Diaz both hit two, David Wright, Mike Piazza & Doug Mientkiewicz all hit one. 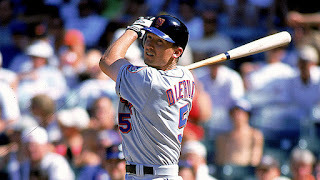 The Mets would put up five more runs in that 7th inning on hits from Matt Franco, Roger Cedeno & Rey Ordonez. They went on to an 11-3 victory.